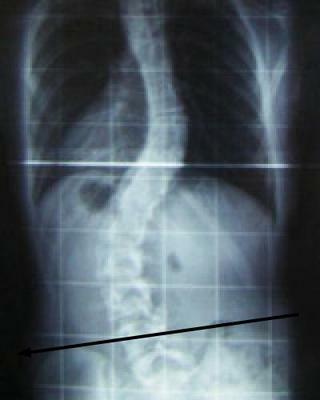 I developed an idiopathic scoliosis when I was in my 10th grade and now I am 18 years of age. I never experienced any pain at first but now I kind of experience back pains and get tired after standing for long hours. I don't go through my menstruation in a normal way; I skip months. I once consulted physiotherapists when I first discovered I had this condition and they could not tell what it was till I researched about it myself and found out it was scoliosis. I am worried about my future; please help. Most thoraco-lumbar scolioses are caused by a short leg; it's not uncommon, and can usually be corrected by the simple insert of an inner in the shoe. Very occasionally, an inner will improve the scoliosis but aggravate the pelvis; it's not common. The norm is that an inner will correct both the pelvis and the spine. The difficulty is whether it should go just under the heel, or the whole sole, and just how thick it should be. Chiropractors have ways for testing for this. Those with a short leg and scoliosis must do lower back exercises every morning before getting out of bed; for the rest of their lives. In fact, I believe we all should, just as we brush our teeth, whether we have pain or not. None of this is a substitute for chiropractic treatment; it's simply a huge helper, gives you control over your back, and means you'll need far less treatment. Print this out and take it to a local chiropractor whom your friends and your doctor recommend. You may need a STANDING X-ray of your pelvis.